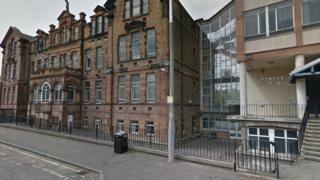 A school in Edinburgh has failed to recruit two new maths teachers at the second attempt. The maths department at Trinity Academy has had two vacancies since the summer. A fresh deadline for applicants has now passed but no-one with the necessary skills and experience applied. Temporary arrangements are in place. The problems experienced by the school highlight ongoing concerns about the number of science, maths and technology teachers across Scotland. Although some schools in other parts of Scotland - especially some rural areas - have faced greater difficulties overall, the fact a school with a good reputation, close to the centre of Edinburgh, cannot fill two routine vacancies throws the national issue into sharp focus. Non-certificate classes are sometimes being taught by teachers whose normal specialism is in other fields - however they all studied maths at university or gained their degree in the subject. Current university students are also coming in to offer pupils extra help and support but are not left in charge of classes and are not leading lessons. Official figures released earlier this week found that the number of teachers working in Scotland had gone up by 500 on last year, while a record number of teachers who have completed their probationary year are securing work. However, concern remains about the difficulties some councils are experiencing filling vacancies - especially in some rural areas and particularly in secondary subjects. A City of Edinburgh Council spokesperson said: "We have been working closely with the school over filling the vacancies and will continue with the various measures put in place, which has the support of the Parent Council, to minimise disruption to the pupils' learning. Our priority remains ensuring that the curriculum continues to be delivered to the highest possible standard." The vacancies are expected to be formally re-advertised shortly. In a recent blog post, the school's rector Bryan Paterson sought to reassure parents about misleading reports in some parts of the media and praised the way teachers, the schools's Parent Council and Edinburgh City Council itself had tried to deal with the difficulties. Mr Paterson said seeking probationer teachers in the New Year could prove to be the best option. They could go on to become permanent teachers allowing, Mr Paterson said, the school to "grow our own" staff. The largest teachers' union the EIS see the problems Trinity has experienced finding applicants as part of a bigger challenge. They said: "It is clear that there are teacher recruitment challenges in a number of geographical and curricular areas, including the Stem subjects. It is essential that sufficient numbers of qualified teachers are deployed to ensure consistency and quality of provision across the country in all areas of the curriculum. "The solution to these recruitment difficulties must include actions to make teaching a more attractive career to highly-qualified graduates - including a reduction in excessive workload pressures and significant improvements to teachers' pay following a decade of real-terms salary cuts." The Scottish government has increased the number of places in teacher training although, as BBC Scotland recently reported, a significant proportion of the places have not been filled. It has also launched an advertising campaign to try to encourage more people to become teachers and helped establish alternative ways to become a teacher to complement the main system. For example, Strathclyde University has a scheme which reduces the length of time some students take to qualify. A Scottish government spokesperson said: "Although teacher recruitment is a matter for local authorities, we recognise some areas have faced challenges filling vacancies. This is why we have invested £88m in 2017 alone, resulting in 453 more teachers in Scottish classrooms than last year. "We have taken decisive action to help recruit and retain teachers through our Teaching Makes People campaign, focusing specifically on attracting new teachers and career changers into Stem and other subjects. "We also recently announced bursaries of £20,000 for career changers to train to become teachers of priority Stem subjects." Any teacher training scheme in Scotland has to be accredited by the General Teaching Council for Scotland.